The Stylvent Series can be wall or window mounted and is suitable for a wide range of applications. The 230 and 300 models can be wired for exhaust or supply mode or dual purpose using an optional reversing switch. 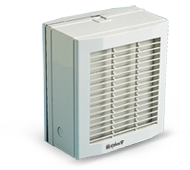 Supply or exhaust air in toilets, shower rooms, conference rooms, living rooms, restaurants, etc. in both domestic and commercial installations. Available in 3 sizes for 230V supply. Models 230 and 300 are suitable for supply or exhaust applications. Model 150 is suitable for exhaust only. For applications requiring both supply and exhaust a reversing switch is available. Electric shutters prevent outside air entering building when fan is switched off. Tough and long lasting ABS plastic. Optional weather Cap for protection against harsh external conditions. For wall mounting, a kit of threaded “wall rods” and sleeves can be supplied as an optional extra. Caters for walls ranging in thickness from 25 to 300mm.